Members of the Buccaneers’ brass likely went to bed Sunday night wrestling with what could only be described as conflicting and bittersweet emotions. Though the Bucs have finally been eliminated from the season-long tortoise race for the NFC South title, they are right in the thick of the death march for the first pick in the 2015 NFL draft. With three games left, Tampa Bay is among five teams tied for the league’s worst record at 2-12. To figure out how they got in position for that consolation prize, all you have to do is look at their 34-17 loss to the Detroit Lions at Ford Field on Sunday. For the umpteenth time this year, the Bucs failed to establish an adequate ground attack, which prohibited them from adequately protecting either their quarterback or the football. That the Bucs weren’t better on offense came as no surprise. The league’s 26th-ranked attack coming in, Tampa Bay has struggled to move the ball all year. But the struggles against Detroit were partly self-induced. Though they took on the league’s top-rated rush defense, the Bucs barely even tried to establish a running game, handing the ball off just five times in the first half and running it a season-low 14 times overall. Four of those runs, by the way, were McCown scrambles out of an ever-collapsing pocket. Smith admitted the Bucs’ failure to even try to establish a ground game helped set them up for failure. “In hindsight, especially with how we ended up passing the ball and not being able to protect it, no, we weren’t committed enough to the run early on,’’ Smith said. “But they dominated us in all phases today, whether we were running the ball or passing it. 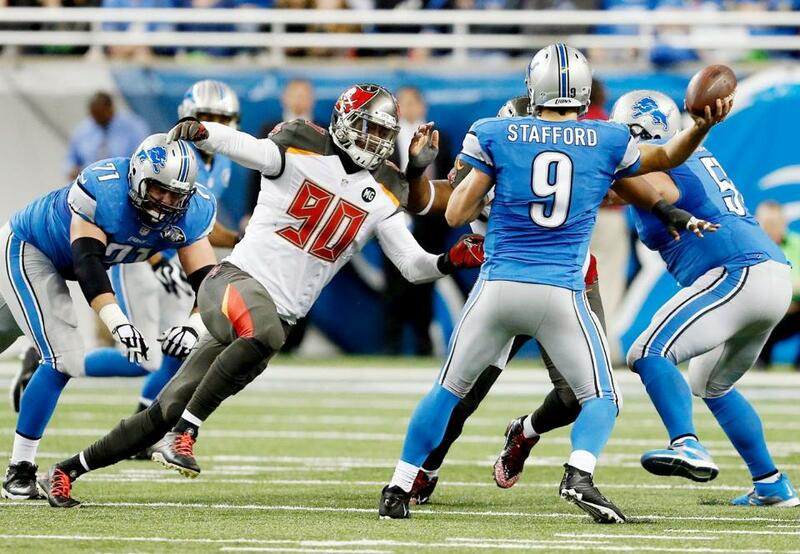 Other than reaching Lions quarterback Matthew Stafford for four sacks, including two by left end Jacquies Smith, the Bucs never really got anything going on the defensive side, either. And that did come as a surprise. Tampa Bay entered the game with one of the hottest defenses in the league, a unit whose performances in allowing 299.7 yards per game over the previous five weeks was fifth-best in the league during that span. The Lions made enough plays to all but put the game out of reach in the second quarter, picking off McCown to set up their second touchdown and falling on a fumbled center exchange to set up a field goal. Those scores gave the Lions a 17-3 lead, and when safety James Ihedgibo made it three takeaways in as many possessions, intercepting McCown in the back of the end zone, the outcome seemed inevitable. But instead of taking the touchback, Ihedgibo ran the ball out of from 7 yards deep in the end zone, eventually fumbling it away on a Luke Stocker strip that allowed Oneil Cousins to fall on the ball at the Lions 10-yard line. That gave the Bucs new life, and they took advantage when McCown threw the first of two touchdown passes to rookie receiver Mike Evans to trim the deficit to 17-10 with five seconds remaining before halftime. As they have all year, though, the Bucs came out flat in the second half, going three plays and out on offense on each of their first three drives and allowing Detroit to regain the momentum. The Lions led 27-10 before the fourth quarter. “Anytime you get into a situation where it’s one-sided, it just makes it tough on whatever that side is,’’ said McCown, who limped around the locker room and addressed the media while wearing an ice pack on his lower back.